Mark Krey began working for Saint Paulus Lutheran Church as the Music Director in the Fall of 2018. Mark’s love affair with music began as a small child singing in his Father’s church in Coney Island. Singing continued to be a central part of his life all through grade school and even into college. Studying under the late Gary Gardner, Mark received a BA in Musical Theater from the Ray Bolger Musical Theater Program at UCLA. Gary always used to ask Mark “Why do you want to be an actor? Actors lead such superficial lives! You should do music ministry. That would suit you!” Mark went on to play Lord Evelyn Oakley his senior year in “Anything Goes” directed by Gary Gardner. Sadly, Gary passed away shortly after Mark graduated. Mark’s an avid songwriter and composer. He released 2 EPs (2013/2015) as well as an LP in 2018. His favorite thing to do is spend time with his girlfriend Bianca. He loves being with his family and lives to be creative. 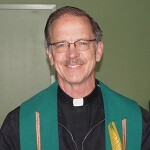 Jordan Ward is the President of Saint Paulus Lutheran Church. He came to the church through its ministry among the homeless, and through the combined love of the congregation and his own character rediscovery has served the church in his capacity as President for 4 years and 7 years on the Church Council. He has guided the congregational ministry by his extraordinary commitment to its life and mission, and by his dedication and hard work, and his developing skills as leader. Jordan also coordinates the congregation’s ministry to the HIV/AIDS community through a program known as the “Friendship Banquet”. This work has been carried forward into Saint Paulus’ collaborative ministry, SFCARES, in which Jordan serves as Treasurer and Board Member. Barbara Solberg is the Vice President of Saint Paulus Lutheran Church, having served in this capacity for 2 years, and many years as a standing member of the Church Council. An active member of the congregation she has also participated in the development planning for the new church facility over the years, coordinated countless congregational events, acted as adviser and confidant for members, and welcomed many visitors and seekers guiding them into deeper association or membership with the congregation. Barbara is the mother of five adult children, worked as a nurse in a number of medical fields (now retired), and has been married to and shared her life with Pastor Solberg for more than 25 years. She is a native of Pittsburgh, PA. Her additional interests include interior design and decorating, drawing, and cooking.